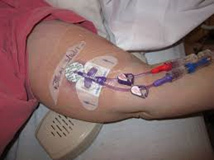 A Peripherally Inserted Central Catheter is a long thin tube that is inserted into a vein in the upper arm and positioned in the body above the heart. The catheter is designed to remain in the body for up to 6 months. You do not need to stay in hospital while you have a PICC. It is important to keep the patient safety card on you at all times as not all PICC’s are the same. 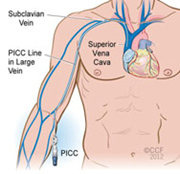 Check with your nurses before you leave the department if you have had a “Power PICC” inserted. Veins that are difficult to access. Your PICC can be used for taking blood and CT scans involving injection of contrast. Once your treatment is complete and you no longer require the PICC it can be removed. The procedure can take between 15-30 mins. You will be able to sit up immediately after the procedure. If you need to take some time off work – please let the nurses know so they can organise a medical certificate for you. An attendance certificate can be provided for your carer. You do not need to have someone accompany you home – check with the department you are attending as they may have different requirments. If you have been unwell in the week leading up to your procedure date, please contact MIVIR as your procedure may need to be rebooked. You will need to present to the Day Procedure Unit on the day of your appointment – your admission time will be sent to you with your appointment time. This will allow the nurses time to complete your admission paperwork and any other tests that may be required such as blood. You are not required to fast for this procedure. You may continue to take any regular medication. Please continue to take your blood pressure medication. Please bring a list of your medications with you. You will be required to change into a hospital gown; you may leave your underwear on. You will be taken into the Angiography Suite and positioned on the table. A combination of Ultrasound and Fluoroscopy will be used throughout the procedure to safely and accurately insert the PICC. A cold antiseptic solution will be used to clean the arm on the side of insertion. Sterile drapes will be used to cover you leaving only the insertion site uncovered. Local anaesthetic will be injected into the skin and will sting for 15-20 seconds. You should only feel pushing and pressure after this. A butterfly dressing (statloc) will be used to secure the PICC to your arm. A waterproof dressing will be put over the securing device. It may look similar to the image above. Once the procedure is finished the PICC is ready for use, a chest x-ray is not required to check the position as this was done before the procedure was complete. Your blood pressure will only need to be taken once in recovery. The nursing staff will check the insertion site every 15 minutes for 1 hour to make sure there is no swelling of bleeding. You will be given something to eat and drink. If you are being discharged home, your recovery period is approximately 1 hour. You will be given a letter from the nurses with some discharge instructions and any other relevant information related to your procedure. If you require any nursing care this will be arranged before you are discharged fro the hospital. You may be required make a follow-up appointment with Dr Vrazas. This can be made at your convenience by phoning MIVIR on 9411 7165. It extremely important to keep the insertion site dry. A plastic bag may be taped to the arm for showering purposes. Tight, restrictive clothing should be avoided. Carrying heavy objects should be avoided. The chest dressing must remain intact for 7 days after the procedure unless it is being used. If you notice any of the following, call an ambulance or present to your nearest Emergency Department. Fevers or generally feeling unwell. Pain, swelling, redness or drainage of pus around the insertion site. Swelling of the neck, face or arm on the side where the PICC is inserted. Shortness of breath or dizziness.